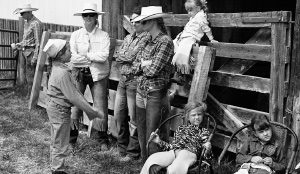 Over the summer I had the chance to visit Lonetree Ranch in Wyoming and talk with Marissa Taylor about her family’s ranching operation. Marissa’s name had come up repeatedly while planning this series on regenerative ranches, especially from participants of the Western Landowners Alliance’s Women in Ranching program, so I was excited to meet her and see the ranch. Lonetree Ranch is a spectacular landscape straddling 1.5 miles of the Henry’s Fork River. In 2009, Marissa’s parents, Robert and Maggie, purchased the ranch and committed to stewarding it in a way that would sustainably produce economic and ecologic value for them and their community. Over the last ten years, this work has included: repairing and protecting riparian areas, increasing irrigation efficiency, supporting wildlife habitat, grazing to promote soil health and increase forage production and improving the safety and efficiency of their cattle operation with high tech planning and monitoring tools, traditional herd dogs and low-stress livestock management. Read the Lonetree Ranch case study here. This is the third in a series of articles highlighting case studies showing the benefits of regenerative practices on working lands by guest contributor Kevin Watt. Kevin served as the TomKat Ranch Land & Livestock Manager until 2017 and now works on research, outreach and special projects for the ranch.